You can also show the sticker in a split screen view, or draw on it, because who doesn’t like to draw on faces? 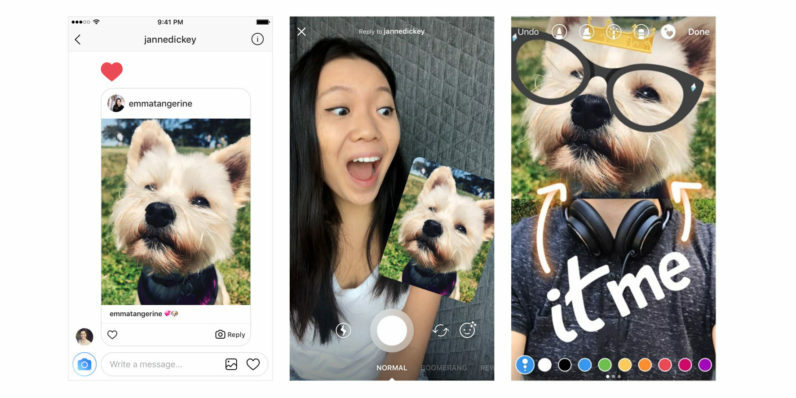 It’s a clever way to make Direct a little more fun and useful, and capitalize on the Snapchat-inspired functionality that has helped power Instagram’s continued growth. Instagram is a visual medium, after all, so what better way to reply to a photo than with another photo? It’s basically the visual version of threaded messaging. The feature is rolling out as part of Instagram version 10.34 on Android and iOS. Now how long until someones creates the Direct reply equivalent of an infinity mirror?